Murfie seeks to be the friendly media ownership platform. In these posts we talk about what it means to us to respect the stakeholders in the media ecology, and how Murfie is doing it. We discuss our thinking, implementation, and plans for rights holders and collection owners alike to sell new and used media backed by material objects you can hold in your hand. We talk about how and where we seek to improve digital access by owners and partners via the services and APIs we provide. We’ll provide information about our design and how it performs to discourage infringing and illegal use cases, and we’ll want to hear everyone’s concerns. We want to bring attention to the evolution of copyright and its impact on people within creative industries: musicians, producers and writers, to name a few. We’ll talk about where we would like to see the law and market go to increase healthy cooperation and competition among vendors, increase prosperity and exposure for professional creators, and foster both great consumer experiences and broadened opportunity to create and contribute for everyone. The answer may surprise you. Which album on Murfie has the distinction of being purchased the most times in 2011? Cast your vote! Okay, so you’ve got a personal shop on Murfie, but you’re just letting it sit there…that don’t impress me much. (Just kidding, I think it’s special either way.) The fact remains, though, that taking charge of your destiny will always get you there faster. In this case, that means promoting your collection of CDs to make more sales. Here’s some tips on how to do that. 1) Use social media. If you’re on Facebook (which is like everybody), do a status update about your shop. Just provide a little info (and wit or humor to make things interesting), and include your shop URL. [What’s a shop URL?] If you’re on Twitter, share your collection in a similar manner. If you do nothing else, dropping that URL is what matters most: that’s what gets folks to visit your shop. Facebook and Twitter are just the biggies. There’s plenty of other social media platforms out there, like Tumblr, Google+, and Delicious. It all depends on how creative you want to get. A final thought. Brevity is best when it comes to social media. Don’t try to write a novel. 2) Blog (or microblog) about it. It’s in vogue these days to manage a personal blog. If you already manage one, you’ve got a built-in advantage on your hands: write something about your shop in a post and publish it. Then share the URL on…what else?…Facebook and Twitter! If you don’t have a blog, services like Blogger and WordPress make it easy to create your own. 3) Check out classified ads services. This is probably the most direct way to S-E-L-L your CD collection. Create and post an ad on a site like Craigslist. It’s free, and we’ve already got an FAQ for you on how to post an ad on Craigslist. Other free services include Oodle, Adoos, eBay Classifieds, BuyMyStuff, and Backpage. As with social media and blogging, it’s super important to include your shop URL in your classified ad, on whichever service you end up using. Your turn! If you’ve got an unconventional approach to selling the CDs in your personal shop, pray do tell us in the comments section below. We’d love to hear about your strategy. Remember: sharing is caring! I’ll admit, I didn’t get trading at first. I got an email telling me that someone had offered me a trade. I read the message closely, looked at my options and thought – hold on now, I offer what, and then accept who? BUT let me tell you: once you complete your first trade, I can almost promise that you’ll be hooked. So let me break it down real nice and easy – no fuss, no muss! First, hop on over to Murfie and start a-lookin’ at albums. See a disc you like? [Maybe something classic, like this.] Hit the blue “Offer Trade” button that’s on the album page. 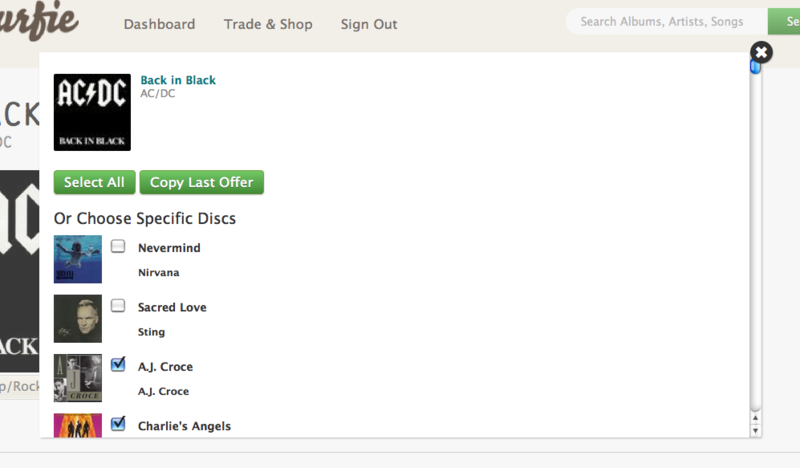 Once you hit that magic button, you’ll be prompted to select some of your own discs for trade. (Eye for an eye, people!) Feel free to offer everything in your Murfie collection by hitting the “Select All” button OR just a couple discs by checking the box next to whichever album. You can also copy your last offer by hitting the – what da ya know? – “Copy Last Offer” button. Once you submit the trade offer (hit the button! ), your proposed CD swap will be posted to the recipient’s account, where they get to weigh the options and decide which of your discs they want. If they dig one of the albums you offered – boom, trade completed! You get the disc you wanted (and that other person gets the disc they wanted)…and you will both be notified via email. The first time I completed a trade, I wanted to give someone a high five (sadly, I was alone). I also wanted more. I offered five or six more trades within the next day. It kind of felt like I was getting away with something whenever I completed a trade. But of course, I wasn’t. It’s just part of the awesomeness of the Murfie universe. And folks, that’s no crime! So, don’t be bashful. Get out there and offer up a trade. And then, not to be pushy, but do it again!